The cutting tools that fit the horizontal arbor are in the form of circular disks with the cutting teeth round the outside edge. This disk has a hole in its center that accurately locates it on the arbor. The spacers can be used to position the cutter at any position along the arbor. The arbor is then filled up with more spacers and these are then all clamped together by means of the special nut. Only cutters that have the right size hole can be used on any particular arbor. Arbors can be either imperial or metric. But in the market for second hand cutters by far the most common size is 1 inch. A key should be used for the cutter so it cannot rotate round on the arbor. The key should fit the keyway on the cutter tightly. It is also possible to have more than one cutter on the arbor. These can be spaced apart or they can be placed so they are adjacent to each other. Spacers are made specially to do this. It is possible to make cutters for the horizontal arbor that are similar to fly cutters. In that they have only one cutting edge. This is useful where a cutting edge of a particular form has to be improvised, for example, a cutter for cutting gear teeth. One important difference between using vertical cutters and horizontal cutters is that with vertical cutters the forces applied to the workpiece can vary in direction all the time. Very often this means that the maximum cutting force that can be used is limited to the force that can be used in the worst case. Consider where the workpiece is held in a vice. A force against a jaw can be very large whereas a force pushing the workpiece sideways will have to be much less. With horizontal cutters the direction of the force is usually simple and obvious. So long as the system being used to hold the workpiece is adequate in the direction of this force any other forces are not a problem. With all horizontal type cutters it is often the case that the cutter is symmetrical. It will only cut one way round but if put on the arbor the other way round it can cut if rotated in reverse. Furthermore it will cut the same shape either way round. Some cutters are not symmetrical. They will run in reverse but the shape cut will be reversed. The fig. shows two cutters both of which are flat on one side but cut a 30° shape on the other. The one on the right is said to be right handed. One common cutter is the slitting saw. This will cut a slot the same width as the cutter. The usefulness of this is that a slot of only a few hundredths thickness can be cut. This is not only far narrower than could possibly be cut with an endmill but it has a much better finish. But, of course, the slot cut this way cannot have a vertical end. Usually, but not always, a cut like this will go straight through the workpiece from one side to the other. One exception is when it is used for making graduations. These thin cutters only cut true when they are cutting with metal on both sides of the cutter. Where a slitting saw is used to clean up an edge of a sheet or of a block the force pushing the saw aside is related to the depth of cut and the width of the cutter. For example a 2mm cutter will not cut a sheet of aluminium 12mm thick unless there is at least 5-10mm on the waste side. But the same cutter will cut the same sheet with 5mm waste if each pass of the cutter is only 2mm deep. 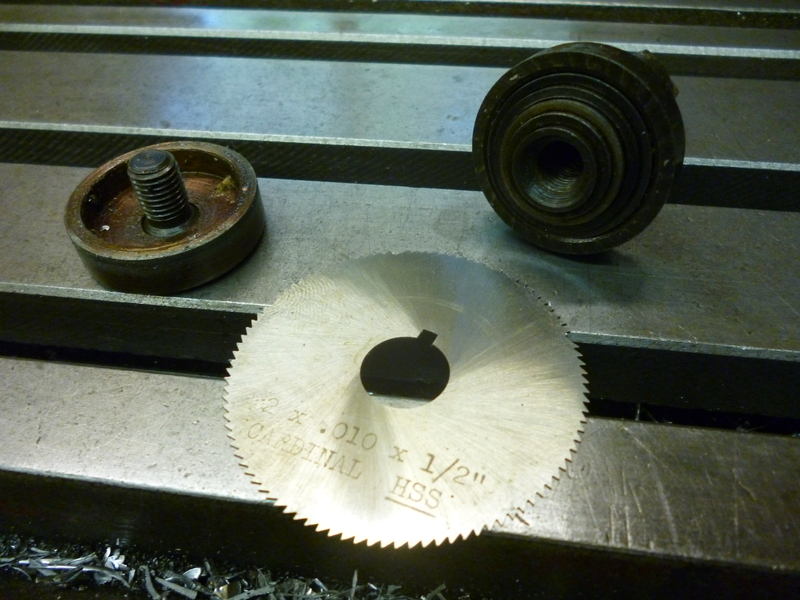 If several slitting saws are spaced apart on a stub arbor for example to cut the fins on a cylinder head, if the fins are too thin they will warp very slightly, the saws will get stuck and will break. It follows from this that it is not possible to cut a slit, say, 1mm wide and then increase the width by milling another slot next to it. In practice, with thin slitting saws slot have to be cut with the width of cutter needed. Slitting saws usually come in standard metric or imperial sizes. Odd sizes are made for special purposes. One example of this is for making the slots in the heads of screws. 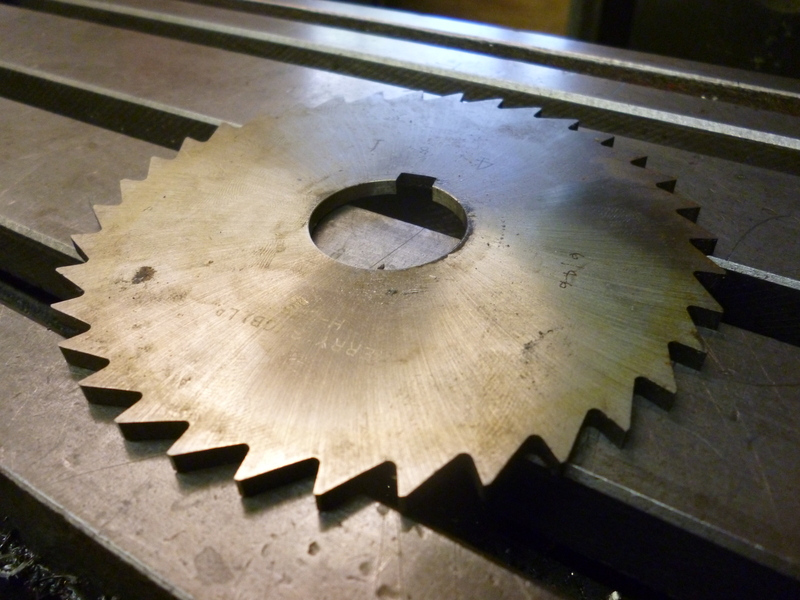 Thin slitting saws are often of limited diameter, about 100mm. Large but thin slitting saws are sometimes used with keeper plates to make them more rigid and so produce a straight slot where otherwise they would drift off course. As slitting saws get thinner and thinner they tend to get smaller and smaller. As they get smaller the hole in the middle gets smaller and becomes too small to use with the standard horizontal arbor. They can be used on a large machine by using a small arbour with a ½ inch parallel shank. 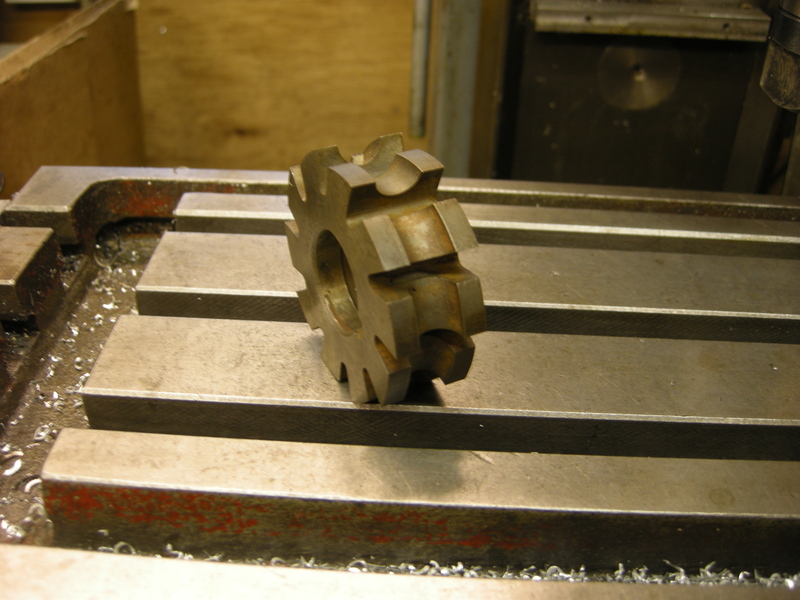 This can be held in a collet chuck (but not an Autolock one). 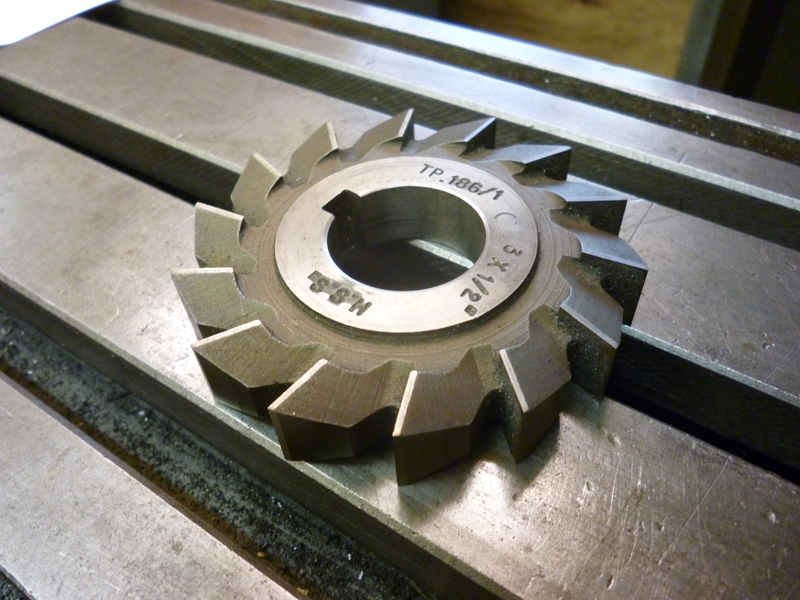 This particular type is made so a cutter with a bore of ½ , 5/8, ¾ or 7/8inches can be used. When a slitting saw is broken it is often worth saving the bigger bits. These can be used as material for making other cutting tools. They can be made into cutters for graduating. Larger pieces can be made into parting tools. Often when using the mill in the horizontal mode it will be found that cutters of the usual 100mm diameter will mean that the arbor will often clash with any clamps that are used to hold the workpiece. 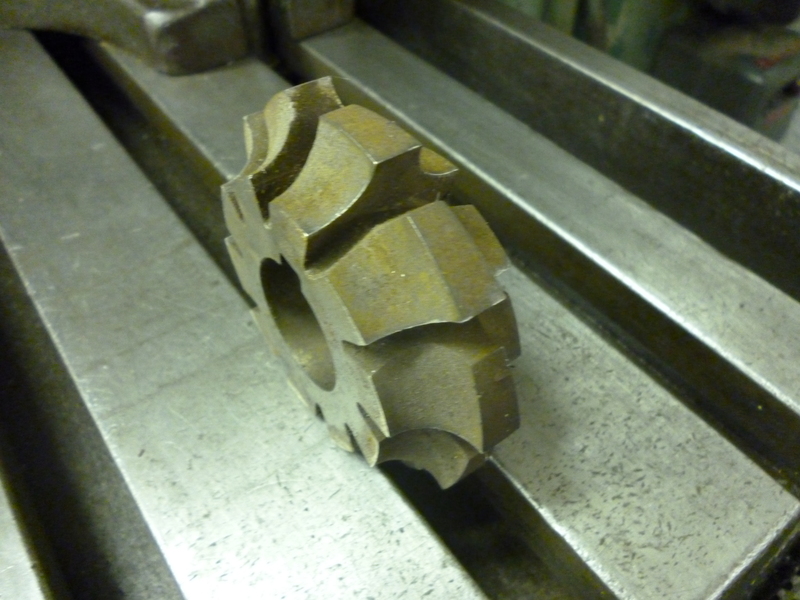 It is often useful to have a few cutters of a larger diameter. Similarly when using horizontal type cutters on a stub arbor in vertical mode a very wide cutter will cut a workpiece without it hitting the vertical head. 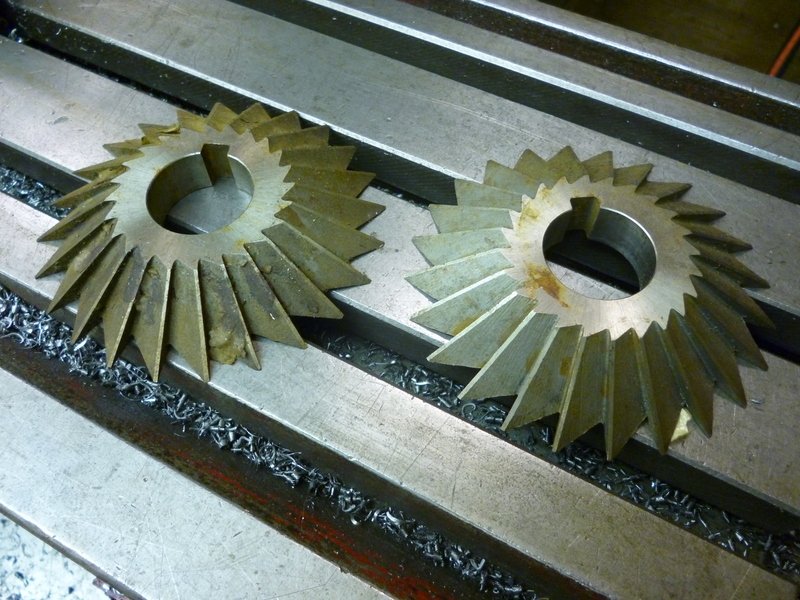 Thicker cutters can easily be up to 200mm diameter. This is useful when held on an arbor in the vertical head because the cutting edge can clear the vertical head. Wider cutters are known as side and face cutters. They have cutting edges both on the circumference of the cutter and on its sides. These are much more rigid than slitting saws and a cut can be widened by making a second cut next to the first. Where the width of the teeth is wider than the depth of the hole in the middle these cannot be fitted next to each other on an arbor. These are a challenge when it comes to sharpening. But is it the front of the tooth that does most of the work and this is not difficult to sharpen. Very wide cutters are known as a slab mills. These only cut on the circumference – not on the sides. On the other hand they are usually of limited diameter. They are not designed to cut slots but to cut large, flat surfaces. These can be used with a side and face cutter at either end so as to cut three sides of a block in one go. Slab cutters always have helical teeth so as to give a smoother cutting action. This invariably produces end thrust when cutting. Ideally if there is more than one wide cutter like this the helices should alternate so as to cancel each other out as much as possible. If after this there is still a significant end trust then it should be towards the spindle. Any cutter whose cutting edge is shaped to cut the same shape or form on a workpiece is a “form” cutter. 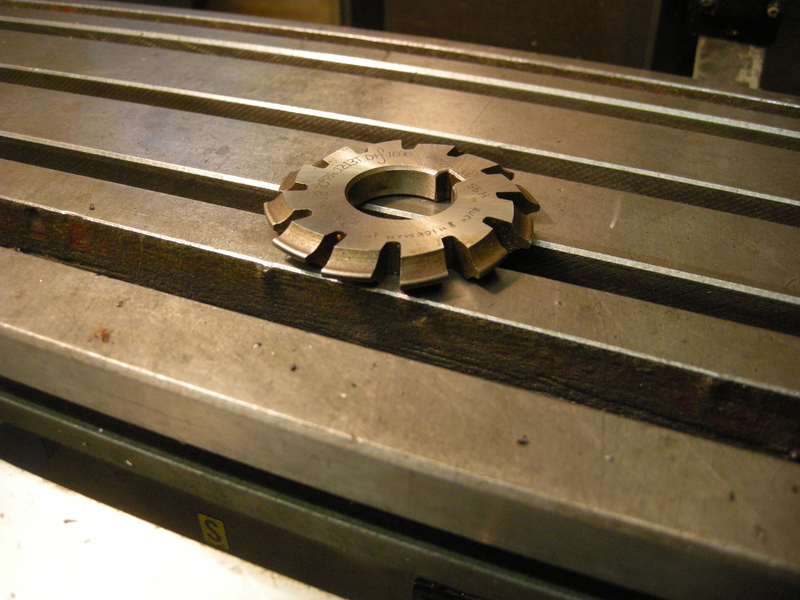 The most interesting type of form cutter is the gear cutter but many other types exist. 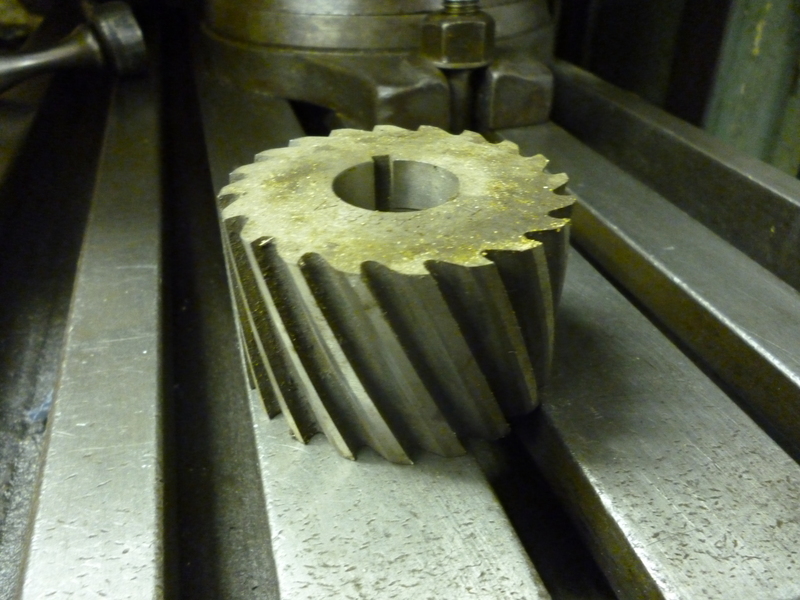 A cutter with the right shape teeth can be used to cut gear wheels. Much more on this later. Cutters also exist that can cut round edges either concave or convex. Whereas with a radius cutter designed for in the vertical mode it is only possible to cut a convex 90° sector. It is possible with a horizontal cutter of the right shape to cut a convex or concave 180° sector. Generally, this cutter cannot cut a 90° arc. This needs a different cutter. Cutters also exist that will either single or double edges at common angles such as 22.5º, 30º, 45º and 60º. Since any of these cutters can only cut one way round if the section is not symmetrical then it is possible for both a left handed and a right handed version to exist. 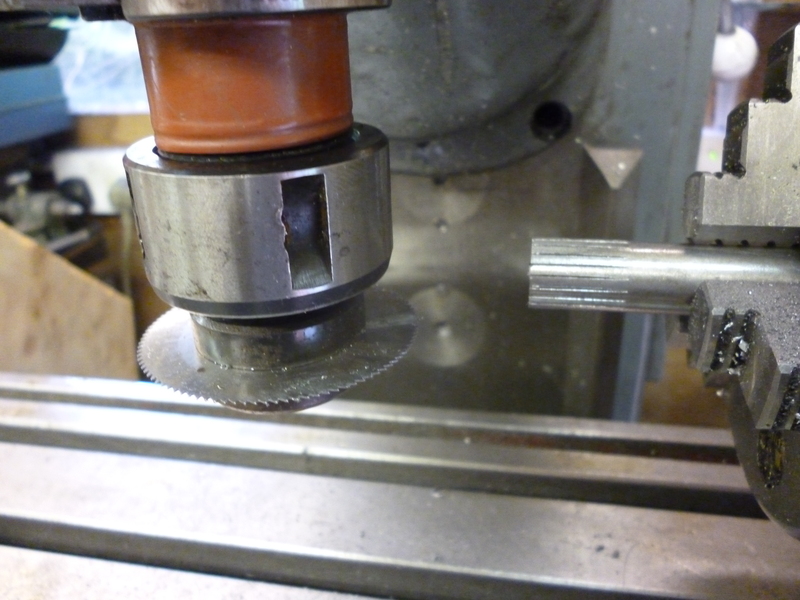 It is possible to use a non-symmetrical cutter the “wrong” way round if it possible to run the milling machine spindle in reverse. Since the original incentive for the invention of the milling machine was to cut the flutes in twist drills there is a whole range of cutters shaped to cut such flutes. In the same way as a fly cutter can be used in a vertical mode it is also possible to have a fly cutter in the horizontal mode. 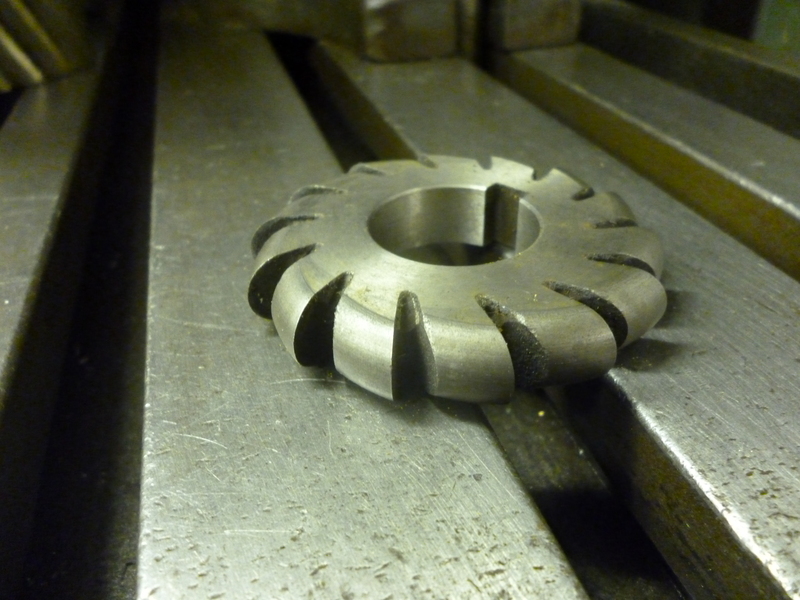 The merit of this is that where a complicated shape needs to be machined, for example a gear tooth, if a cutter cannot be obtained it is much easier to shape one cutting edge on a fly cutter than on a proper cutter which would have many teeth. On a horizontal milling machine the angle of the cutter to the milling table is fixed. It is possible to use horizontal cutters another so other angles can be made from them. One way of doing this is to fit the horizontal arbor into the vertical socket when it is in the horizontal position. Usually this might be done with this arbor horizontal. But, suppose it is necessary to cut a 46º and 46º groove. This could be cut with a 45º and 45º cutter. The cut would be made twice. The first time the arbor would be turned by 1º one way. The second time the arbor would be turned by 1º the other way. I am a former toolroom miller, working mainly on Bridgeports and other turret mills for nineteen years (including a five year indentured apprenticeship). That was before going to university and studying international relations. There is usually no career path as a skilled man. I found your blog accurate and informative and very useful to those without our experience. Thank you for passing on your expertise. Sometimes with the larger slitting saws (especially the thinner ones) they come with a larger bore size. So if your arbor is 1″ the slitting saw bore size might be 1.25″ and to accommodate this a stepped arbor collar has to be machined with a 1.25″ bore and the step being less than the width of the slitting saw to enable clamping. Which reminds me a lot of damage can be done to arbors where sltting saws have not been keyed, and even when they have occasionally, when the torque on the cutter is very high, they will even, after repetitive use in the same position on the arbor, cut through the keysteel (which after all is only mild steel). the largest slitting saws I have are 8 in in diameter. 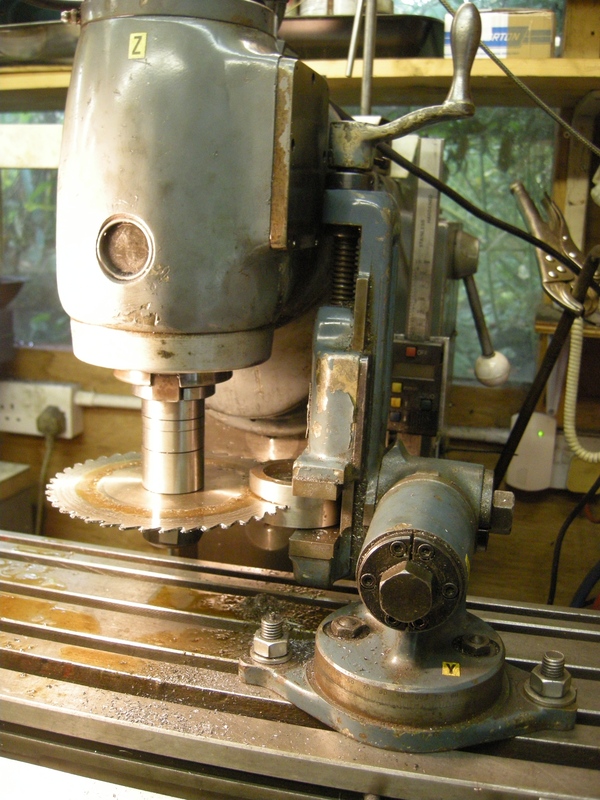 If you see my page on using a vertical mill to do horizontal milling you will see that the key to this is using very large slitting saws.I try to standardised everything so more bits fit together easily. So larger size slitting saws are all imperial and with one inch bores. I am very conservative about the amount I cut so that, so far, I have not had trouble with keys being damaged. Most of us don’t have trouble. I’ve seen this damage to the arbor in production runs on the shop-floor.